I’m flip-flopping along Honolulu’s Kealakaua Avenue, among hordes of tourists in search of sunshine and tropical drinks stirred with pineapple spears. This is Vegas-by-the-Sea, packed with tawdry glitz, upscale glamor and crowds. 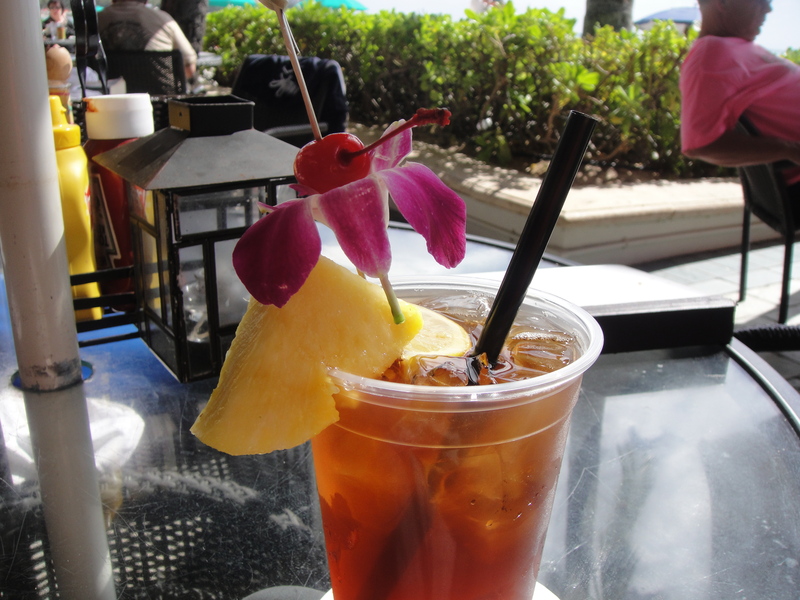 Not my usual cup of tea, yet here I am, settling now onto the warm sand of Waikiki, mai-tai in hand, happily watching the surf roll in. I’m surrounded by acres of sunburnt flesh, much of it squeezed into bikinis so skimpy they could fit in my pocket. People-watching can be a full-time hobby here, with all ages and sizes dressed—or barely dressed—in every possible outfit. 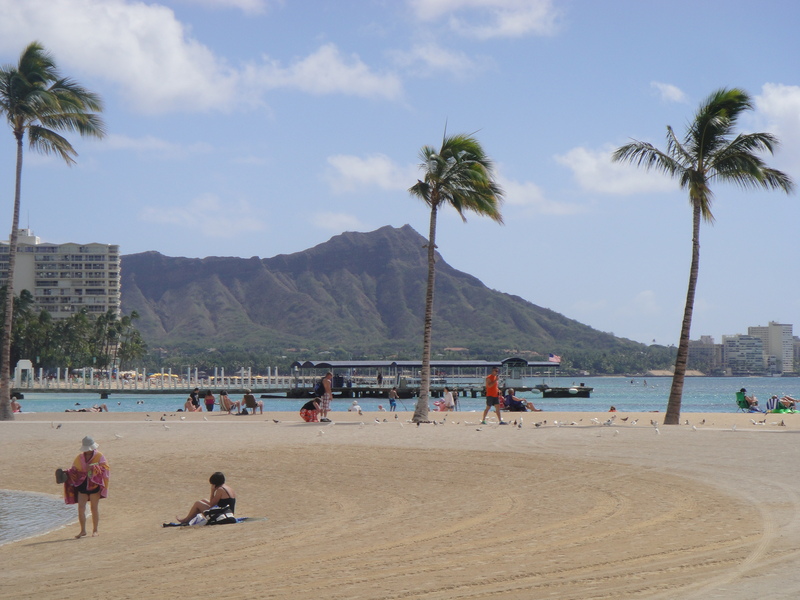 Waikiki has lost its long-ago quiet, lazy appeal, but the soft breezes, sunshine, waving palm trees, and rugged beauty of Diamond Head are still here. 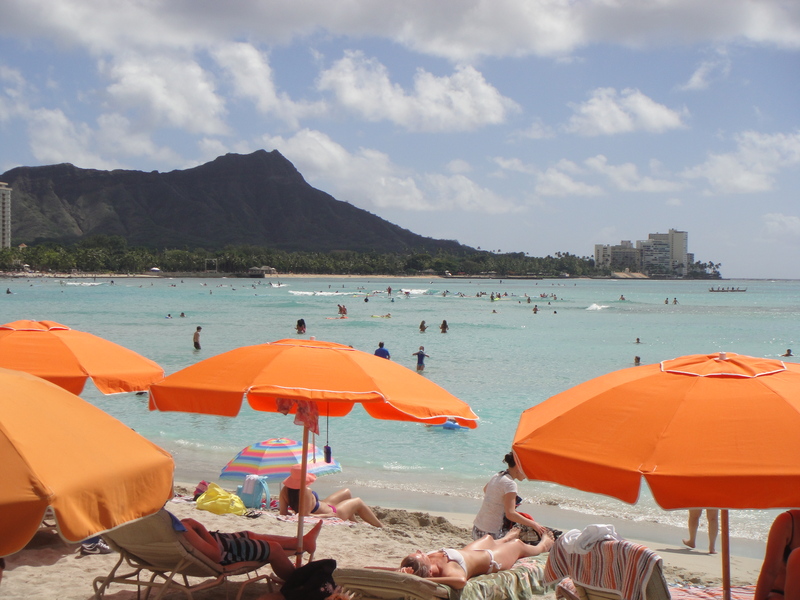 The long white beaches are perfect, and Hawaii tourism interests plan to keep them that way. To fight erosion, they built walls and used to barge sand in from California. More recently it’s been carted from nearby shoals to restore the shoreline and widen the beach. Here’s what draws me, besides the climate and setting: local papaya and pineapple for breakfast, concerts and hula dances in Queen Kapiolani Park, swimming with colorful fish, the grace of practiced surfboarders, a relaxed and friendly (mostly) culture, shopping and chatting at farmers’ markets—tourist brochures list where to find them, and three are an easy walk from my condo rental. 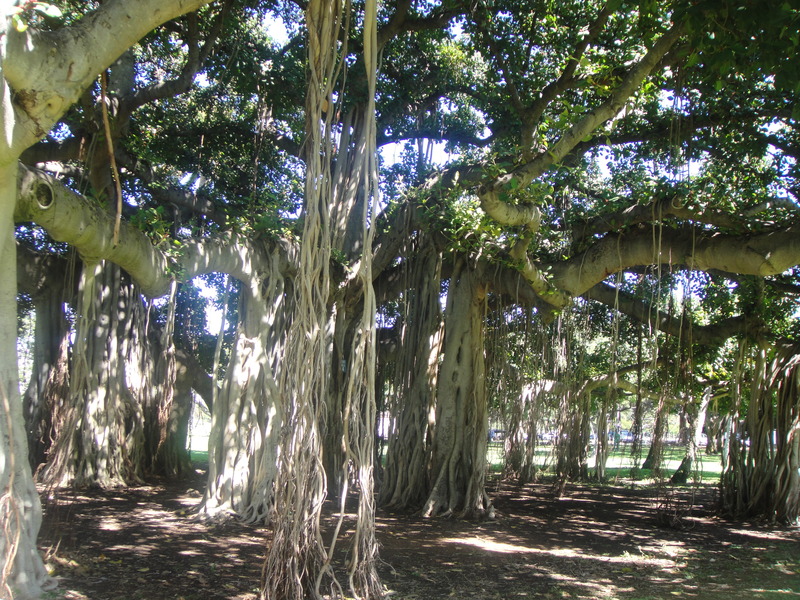 I like walking through the 100-acre banyan-shaded park, with a stop for a lunch of grilled mahi-mahi at Barefoot Beach Cafe. Or I continue on to lunch at lovely Hau Tree Lanai, where Robert Louis Stevenson used to hang out. On the return walk I stop to read every historical plaque. 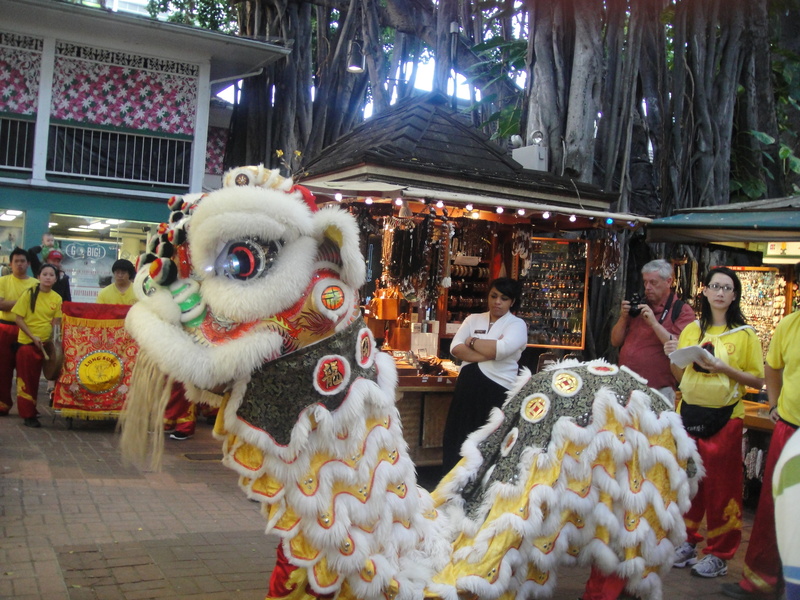 Hawaii has a rich history, full of war and beauty and sorrow. Back on Kealakaua I pass kids texting, guys lugging surfboards, hustlers selling tours, street people scrounging trash bins. Musicians play on the street corners. Nobody bats an eye at the strolling Santa with his violin, the muscle-bound man covered in tattoos, the young women in minuscule shorts and stiletto heels. Stores advertise everything from high fashion to t-shirts with sslogans that prove bad taste knows no bounds: “Sluts rule.” “I just want to pee on everything.” And the ubiquitous “I’m with Stupid.” Festivals keep popping up; here comes the Chinese New Year lion, with his clanging entourage, growling for money from local shops. When it’s time to eat, choices are everywhere. I skip the fast-food chains, of course, and go for local sushi or pho or, for a pricier meal head for the Asian/Pacific fusion food at ever-popular Roy’s. Also good: Il Lupino’s veal scallopini and arugula salad with almonds and spiced pears, evoking memories of Sicily. My favorite lunch place is the classic Moana Surfrider, where I’ll sit on the veranda above the beach and feast on soy-glazed salmon. Lots of Japanese wedding parties are held here, so I get to admire the gorgeous brides in their fluffy white gowns. I find a lively, fun atmosphere at Duke’s, which has memorabilia of the famous athlete. And I always go for a last-evening watch-the-sunset drink at the Royal Hawaiian. Waikiki can be off-putting, especially if you’re looking for tranquility, and Honolulu offers many other attractions—fabulous botanical gardens, Chinatown, museums, temples, historic sites—but those are for another time. 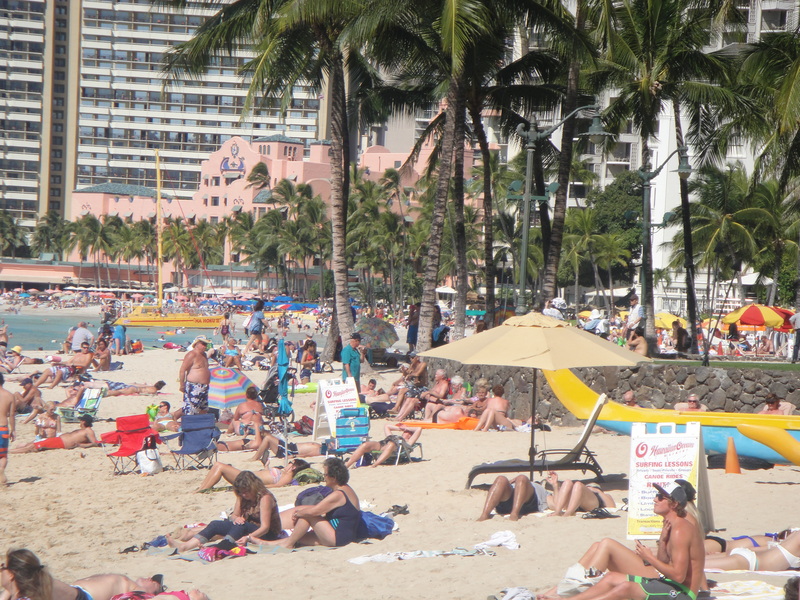 Today I’m just part of the passing scene, one more sun-loving vacationer in Waikiki. Aloha.